Ayo bangun data center di rumah anda.. Whether you want to add webcam images, weather data, or show the recent traffic around your city on a dashboard, with some HTML skills you can turn your PRTG Map into an amazing information provider! You can add external information to PRTG maps using the Custom HTML map object. View sample map in full size. The external information must be available as an IFRAME or IMG (script based embedding is not supported) with a specified width and height. If your external information uses a script, please create a small webpage on some webserver, place the code there, and then embed this page in your map using an IFRAME. Note: Current browsers only allow custom web-objects that include an SSL certificate. Therefore, IFRAME or IMG objects that link to "http://" objects not "https" will not be displayed in PRTG. Create a new map or open an existing one. Open the Map Designer tab. Choose Custom HTML under Properties on the right side, select the first available map object Custom HTML Element, and drag it into the main window. Click the object in the map. In the HTML Before field at the top of the Properties section on the right side, enter the code that you want to embed in the map. That's it. Your new object will show up in your map and you can move it around. Visit Weather365 to get the code. Dark Sky Maps provides weather maps which you can filter for your required information. Visit Dark Sky Maps, define your desired properties, copy the embed code, and paste it into the PRTG Map Designer. The German "Unwetterzentrale" provides free maps with severe weather warnings for Europe and Germany, which we also use on our office dashboards. Visit Unwetterzentrale: Warnungen für Ihre Homepage, copy the provided code, and paste it into the PRTG Map Designer. Visit Weather Underground to get HTML code for free weather stickers. Saya sudah buktikan, di perumahan Tamansari CyberPark Bogor, kami bisa membangun data center mini, bahkan di ruang kamar tidur utama. Kamar tidur utama disulap menjadi area raised floor sehingga semua perkabelan bisa tertata baik dibawah. Dengan akses fiber optic kecepatan tinggi dari salah satu pusat bandwidth nasional, kami tidak kuatir masalah kecepatan akses Internet. Suasana sejuk kami rasakan sepanjang hari, tetapi kami siapkan 2 unit AC 2 PK untuk menjaga kondisi ruangan. Memang ini sangat tepat bagi para pebisbis online, para usaha startup serta pengusaha yang menggunakan Internet, semua bisa diakomodasi oleh Tamansari Cyber Bogor. Jangan ragu untuk mengambil unit yang masih ada, segera kontak dan jadikan rumah anda sebuah CyberHome.. The boss called, "What's our PUE?" 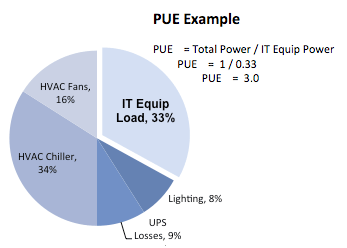 PUE stands for Power Usage Effectiveness and it is rapidly becoming the number to know. In the past, data center managers were simply asked to provide enough space, power and cooling to support the IT equipment. Now, the same managers are being asked to do it efficiently. PUE can be a helpful benchmark. Introduced by the Green Grid, PUE is a measure of efficiency. It is defined as: the total facility power consumed divided by the total IT equipment power consumed. 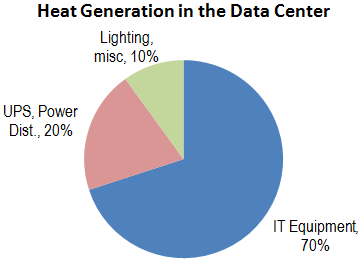 The total facility power is measured at the utility meter for data centers. (For mixed-use facilities like an office building that contains a data center, only the power needed for the computer room should be measured or even estimated.) The facility power includes everything that supports the IT equipment including power, cooling, lighting, etc. The IT equipment power is the load associated with servers, storage, networking, work stations, etc., that are used in the data center. Of course, the total facility power will always be greater than the power required by the IT equipment. So the PUE calculation will always be greater than one. But, how much greater? A PUE of 1.0 would be an ideal situation: no power distribution losses, no chillers, pumps or fans, etc. While that is not possible, industry giants like Microsoft and Google are planning for PUE's of 1.2 or even better. That would truly be best-in-class. Today, according to the Uptime Institute, a typical data center has an average PUE of 2.5. However, it is not uncommon to have a PUE of 3.0 or greater. This means only 1/3 of the power is consumed by the IT equipment. Or, put another way, 2/3 of the power (and the utility bill) is wasted! Whether you are looking to go Green or lower your OpEx, knowing your PUE is the first step. From there a step-by-step plan can be put in place to move that number down. So, measure now—before the boss calls. Tons of electrical energy, Watts of cooling? 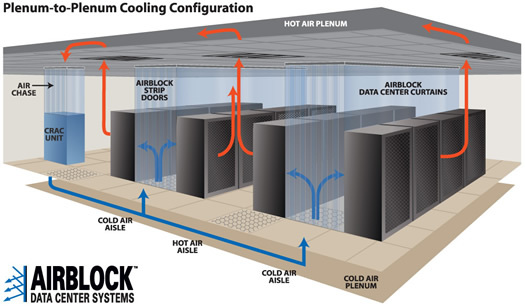 When it comes to data center design, operation and optimization, it is all about power and cooling. Of course, the power supplied and the heat removed are closely related: in their simplest form, both are just measures of energy. Yet, it is often difficult to directly compare the two. The challenge: power and cooling each have their own language. For electrical systems, we use terms like volts, amps, KVA and watts. When discussing cooling we usually talk in terms of tons and BTUs. So, while power and cooling are related, sometimes something gets lost in translation. When that happens, the results can be serious: from dollars lost through inefficiency to unexpected constraints on growth. Fortunately, there are a few simple tricks to quickly compare the power and cooling capacities within the data center. And, when compared apples-to-apples the results can be surprising. What is the electrical load of your data center? The equipment nameplate is one possible place to start. On each piece of IT equipment (or in the manual) there will be a specified power requirement. This is usually given in VoltAmps (VA). You could count up and sum the power requirements for all the IT equipment. However, keep in mind the nameplate is required to list the maximum possible consumption (so wiring and circuit breakers can be properly planned). Actual consumption is usually much less, especially when averaged across all devices. A better-and often easier-approach is to measure the output power at the UPS or PDU. The actual power provided by the UPS or PDU is usually available from the display panel or other interface. This is the true IT load in the room. Most often, this is reported in kiloVoltAmps (kVA). What about watts? Watts is another measure of power and is often used interchangeably with VA. This is not strictly true. However, for IT equipment, the approximation of 1 watt being equal to 1 VA is close enough for discussion. (The actual difference is determined by the power factor of the load. For electronics the power factor is nearly one, meaning the two numbers will be almost equal. Fans, motors, transformers and other equipment have lower power factors and which will result in significant differences.) So, kVA can also be expressed in watts. Either way, this is an expression of power. The next step is to discuss energy. Electrical energy is work done (power consumed) over time. When talking about electrical energy, the most common term is kiloWattHours (kWh). For example, a rack that requires 2.5 kW of power will consume 2.5kWh of energy during one hour. Understanding the energy consumed is important since this will approximate the heat produced. Almost all the energy provided to a server is converted to heat. The conversion is not 100%, but it is close enough to assume each kWh of energy consumed produces one kWh of heat in the rack. There are some additional sources of heat that should also be considered. There will be losses within the UPS and power distribution system. There will also be heat from lighting and even the warm bodies in the room! Here another approximation is useful: the IT load typically contributes 70% of the total heat load. After a little investigation and some back-of-the-envelope calculations, we now know the heat generated in the room. For example, an IT load of 21 kW will use 21 kWh of energy each hour. This is only 70% of the total load. As a result, the entire room will generate 30 kWh of heat per hour. For most data center managers, this is where language breaks down: heat is something discussed in tons or BTUs. What does the number of kWh from the electrical bill have to do with the ton capacity of the CRAC unit? BTU and ton are the most common terms used in heating and cooling calculations. Both are expressions of energy. As discussed above, kWh is also a measure of energy. Therefore, there is no reason cooling cannot be measured in kWh and IT energy consumption in tons! The savvy data center manager will be able to do just that. And, here is the key. Now it is easy to compare power and cooling. Here is an example: A typical 5,000 square foot data center might have an IT load of 20W per square foot. This implies 100 kWh energy use for the IT equipment. Adjust for the other heat producing items (divide by 0.7) and the result it 143 kWh of electrical energy. The same room might have six CRAC units, each rated at 20 tons on the nameplate. The actual cooling delivered by each unit depends on a number of factors (most notably return air temperature). So, we need another rule-of-thumb: assume the actual capacity is 70% of the rated capacity. For the six units combined, the result is 84 tons of cooling. Convert from tons to kWh (multiple by 3.516) and the result is 295 kWh. We can quickly see that the cooling capacity is two times greater than required by the IT load! Once power and cooling are compared in the same terms, the opportunities for optimization (and potential cost savings) become clear. This is only an example, but it shows what is possible once we all speak the same language! Your Data Clean Account Manager can analyze your computer room and provide cost saving cooling and airflow management solutions based on your specific results.